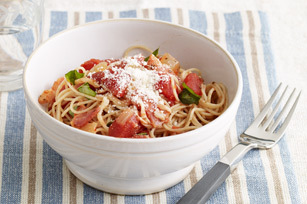 Prepare a pasta dish that is packed with flavor when you make this Tomato-Basil Angel Hair Pasta. This saucy Tomato-Basil Angel Hair Pasta topped with Parmesan will be a new family favorite in no time. Cook bacon in large skillet until crisp. Meanwhile, cook pasta in large saucepan as directed on package, omitting salt. Remove bacon from skillet; drain on paper towels. Discard drippings from skillet. Add onions to skillet; cook 5 to 6 min. or until crisp-tender, stirring occasionally. Drain tomatoes, reserving 1/2 cup liquid. Add tomatoes, reserved liquid and crushed red pepper to onions; simmer 3 min. or until heated through, stirring occasionally. Drain pasta; return to pan. Add tomato mixture, bacon and basil; toss to coat. Add mozzarella; mix lightly. Serve topped with Parmesan.